Chapter 3: "Maiden, Mother, Crone"
An account of the demon lord of hideous giants, numbing cold, and bloody revenge—Kostchtchie the Deathless! 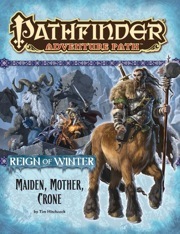 Maiden, Mother, Crone is sanctioned for use in Pathfinder Society Organized Play. The rules for running this Adventure Path and Chronicle sheet are available as a free download (639 KB zip/PDF). This book is a fairly basic wilderness and then dungeon crawl. While I don't mind dungeon romps this one was rather simple and unimpressive. The downside is that there wasn't enough treasure for the level of the game at this point. I ran this for a group of 5 players. The three linked dungeons are filled with fairly random creatures. If you let those creatures sit in their rooms and wait for the PCs (as is implied by default in the adventure), it becomes a kick-in-the-door, kill the monster adventure. And don't get me wrong, that is totally fine if that's what you are looking for, but I prefer more realistic behavior of the inhabitants of a dungeon. Also, the linked nature of the dungeon makes it very difficult to be properly prepared because the players have a lot of options where to explore next. Some groups and GMs will love that aspect, I find it more helpful to have a little bit of rails to guide my preparation, especially with CR 8-13 critters. Another problem is that if you let dungeon's inhabitants behave realistically (i.e., fall back and regroup in other rooms), the entire dungeon becomes an impregnable fortress and the PCs hardly stand a chance at all. Speaking of not a chance: the retrieval of the final McGuffin is also extremely difficult, which feels forced and just is not a lot of fun after just coming out of a climactic battle. I really liked this book when I read through it the first time, the setting is nice and the atmosphere very on-theme, but when I started to actually chart out the sessions and when we played it, it just was not as much fun as it seemed at first. I just hope that the second half of the Adventure Path is going to be more fun. This is a part of Iobaria that I have wanted to know about for quite some time. However, I have noticed a slight error in the book. One page 26, once you have your PC's fighting the Frost Giant in the corridor heading into area C3. The title for this area is actually in the paragraph about the Development and how this Frost Giant calls for help. The title of this room is on the end of that paragraph. Not a big deal but in case others get confused by the description following this paragraph. Now up for preorder! Kostchtchie! Casmaron! Iobaria! Frost giants! Cover image is a mockup and will change. She's gonna get frostbite without a shirt on. Congrats to colleague Tim Hitchcock! Delighted to see another chapter announced! Woohoo! Frost Giants, sounds like you should be higher then level 7. A few beta Mythic rules being used? Iobaria, a land that reminds me of Beowulf. I hope we get a supplement that gives more detail on this part of the world. I know they have a gazetteer for Iobaria in the third Kingmaker adventure. That said, it has a very Slavic feel to it that I really like, especially being founded by Ulfen Vikings, which is a parallel to Kiev Rus (modern day Ukraine). so, "Maiden, Mother, Crone" is a REALLY awesome name for an adventure - not kidding, it's the best Iv'e seen in years ("Seven days to the grave" was also kinda cool). And this is a dungeon heavy module with Mr. Hitchcock? I still have good memories from Trial of the Beast (and good nightmares from Carnival of Tears, too). Looking forward to this AP! so many good things! So, will we finally get Some details on Casmaron when this book rolls around? A Campaign Setting Book perhaps? I really liked the vague nature of the gazetteer in KM(AP #33) - but I do not mind a more detailed look onto/into Deeprun Crevasse. While the coastal regions and the "kingdoms" along the Ardshrod River were ok, the heart lands including the woods and Syrzemyan Highlands intrigued me much more. Do the dungeons mentioned include the cyclops ruins in Vurnirn? Besides: clever Paizonians - it's all there! Hmmm, "three ancient, mystically linked dungeons" according to the product description, plus a certain set of three carved mesas according to Ruyan's spoiler. This sounds interesting ... and it's a Hitchcock module to boot! Casmaron? Yes, please! Would love to get some more description on the continent - be nice to have a few non-human empires in there. I suspect we won't get more info on Casmaron in general, just Iobaria. Even if it there's a few mentions of what's beyond Iobaria would be nice. Am I the only one that thought Game of Thrones when I read the title to this AP? Super excited for the article on Kostchtchie! If I'm not mistake, not counting Lamshtu, this is the first Demon Lord to get it's own write-up no? I imagine will get more back story between Kostchtchie and Baba Yaga too! The write-up will hopefully be another great piece of work by JJ - like the article in Dragon #345! Not to disappoint, but the article is by Sean K Reynolds, keeping in line with all the other deity articles he's written for Pathfinder. Now, going forward, who's to say if James does or doesn't write one of these articles? Stay tuned. No problem, none at all. Both have their unique style. SKR writing the article-to-come, means expanding the scope of the older one no matter what the focus will be. I'm actually most excited about this installment of the AP, because it has more info about Iobaria (which I'm eager to know more about since AP #33), or at least about Deeprun Crevasse, it brings back Kostchtchie and - if following the origins of the triumvirate of mother, maiden, crone (see e. g. Hecate, patron goddess of "crossroads, entrance-ways, fire, light, the Moon, magic, witchcraft, knowledge of herbs and poisonous plants, necromancy, and sorcery") - opens up really cool new interpretations as to what Baba Yaga might represent in the world of Golarion. In short: this will rock! Updated product with final cover image and description! Yeah that is an awesome centaur image, so different from the standard hot weather equipped/furred ones! Nice cover and with a centuar no less. Article about irresen's strange interest with dolls, sounds interesting and toyetic. First impression: I want to play a centaur as my next PC class! So cool! Great cover! Was the location of the gazetteer changed? Or are "Deeprun Crevasse" and "Dvezda Marches" one and the same place? Or is one located within the other? The Deeprun Crevasse is a geographical feature in the region that is called the Dvezda Marches (which is in the northeastern edge of Iobaria). Is that also where the adventure will take place? Northeastern edge, so thats as far away from the inner sea as you can get in Iobaria ... unless you take a shortcut over the crown of the world ... which Kostchtchie probably did. Edit, after reading the wiki article on him: wait a moment ... Kostchtchie actually is from Iobaria, isn't he? I have it on good authority that the monsters in this AP Bestiary are extra-super-plus-good! And several are creepy-weird too! Really liked my volumes 1 & 2, looking forward to being able to page through this puppy. Arooo.. This is probably the first time I've seen a product have its date of released moved earlier. Might not see this type of event again. Glad Paizo stayed away from using Maiden, Mother, Matron and went for something original. ... huh? One's no more original than the other. Heck, I've heard/seen Maiden-Mother-Crone much, much more often in reference to the triune goddess than Maiden-Mother-Matron. It's a Robert Graves / White Goddess reference for sure. Note: You purchased this product today. View order. This is a display error that can occur while our system generates subscription shipments. Our system hasn't generated your monthly order yet, but as soon as it does your My Subscriptions page should reflect your upcoming shipments accurately. You might also wanna check Hecate on e.g. Wikipedia - fits the bill quite nicely (see my post above from January, 28th). That is a cool looking centaur. I too have changed centaurs according to region and climate in my setting (zebrataurs). Wait, this AP has a Dread Flumph in the adventure? Or just in the bestiary?